We can only imagine how legendary being discovered and mentored by thee Beyoncé would be. Back in 2013, Chloe and Halle did just that, but IRL, when they were signed to the living legend’s Parkwood Entertainment. Fast-forward six years later and the sisters, 18 and 20, are already making waves in both music and television. 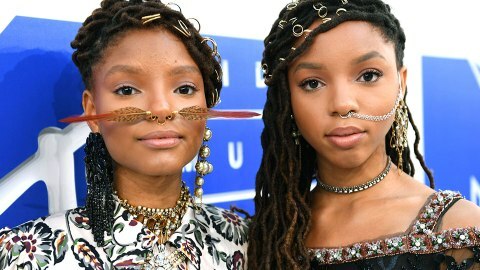 In addition to starring roles on Freeform’s Grownish and a standout debut album The Kids Are Alright, the dynamic duo are nominated for their first-ever Grammy Awards–two to be exact–and we’re hoping they come out on top. Though we love their seriously stunning harmonies and heartfelt lyrics, we get just as excited about their red carpet style. From color-coordinating outfits to chocolate brown locs, the sisters don’t shy away when it comes to their creative style choices. After all, if they are Beyoncé’s protégés, we’d assume rule number one is to stay far away from ordinary. Credit: Alberto E. Rodriguez/Getty Images for Disney. Credit: Jesse Grant/Getty Images for Disney. Locks aren’t boring and these sisters are here to prove it with these inspo-worthy updos. Bring out accent colors in your outfit by sporting a matching eyeshadow like the sisters did with this pink-ish/purple hue. Credit: Matt Winkelmeyer/Getty Images for Children’s Mending Hearts. These hair rings are the perfect addition to their otherwise simple ensembles. This look proves that a poppy lip and turban are all you need to upgrade an everyday makeup look. Credit: Allen Berezovsky/Getty Images for Fashion Media. Don’t sleep on hair accessories. This rose gold rope woven into their strands is appropriate for every age. If you think bright shadow and metallic lips are too daring to recreate, this red carpet look will make you reconsider. We are equally obsessed with the space buns and shimmery ruby lip. Sporting hair rings and not-so-ordinary nose jewelry, in one look, is downright dope. This article was written by Andrea Jordan from StyleCaster and was legally licensed through the NewsCred publisher network. Please direct all licensing questions to legal@newscred.com.